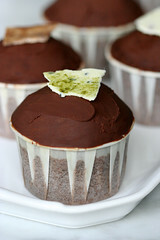 There are a couple of reasons why I made these truffle inspired cupcakes. Firstly, I wanted to spring clean the lazy Susan that is my baking pantry. It got out of control months and months ago like most of my cabinets and closets tend to get. My plan was, while cleaning the pantry, to inspect all my potential ingredients to come up with six different truffle flavor combinations. Secondly, I bought myself a new toy, just arrived, that I was eager to use – a chocolate tempering machine. My plan was to make a topper for each cupcake that identified the ingredients inside. Other than providing an excuse to clean out my pantry and an opportunity for low risk experimenting, I also think these cupcakes could make a nice gift. Get a nice box, provide one or two cupcakes per flavor, a legend, tie a nice ribbon around box and you have a pretty nice homemade gift. 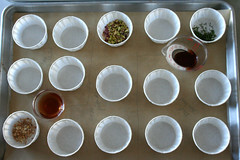 Assemble the ingredients for your six different truffle flavors. I wanted the flavors to be fairly intense so I started with 1 teaspoon of dry ingredients and 2 teaspoons of liquid ingredients. I was generally pleased with the results. I was most pleased with the first four combinations. All were noticeable and enjoyable, even the rosemary-lavender. The rose-pistachio flavor wasn’t distinguishable and the sour cherry was too intense. I would cut back on the Ginja next time. 1. 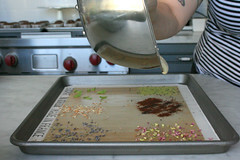 Prepare baking sheets by lining with parchment paper and laying out cupcake cups. Using a pencil draw a line to segregate 4 cupcake cups for each flavor and write out the ingredients so you can identify the cupcakes after they are baked. See image above. I did the same with 6 mini cupcake papers so I could taste each combination without having 6 whole cupcakes. 2. 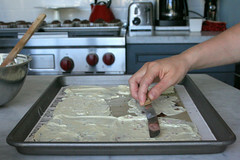 Chop chocolate and transfer into the bowl of a standing mixer. 3. Add butter to the chocolate and place the bowl over a pan of simmering water. Stir until chocolate melts and butter is combined. 4. Remove from heat and stir in sugar. Let mixture cool for 10 minutes. 5. Beat in an electric mixer for 3 minutes. 7. Sift the flour, cocoa powder, baking powder, and salt into the mixture, return to the electric mixer, and mix until blended. 8. Separate into 6 separate, but equal batches. I eyeballed it and came pretty close. Mix truffle ingredients into each batch. I got four regular cupcakes and 1 mini per flavor. 9. Scoop into cupcake cups and bake at 350 F for 25 minutes or until a toothpick comes out clean. 5. Let cool until at spreading consistency. Note: If the ganache gets too thick, like you forget it on the counter or in the fridge, soften over a pan of simmering water just enough to get it back to spreading consistency. 1. 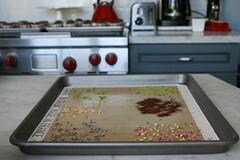 Sprinkle some of each of the truffle ingredients on a silpat or parchment covered baking sheet. 2. Temper white chocolate per machine instructions. 3. 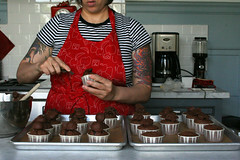 Pour chocolate over the truffle ingredients and gently spread with an offset spatula. 5. Break into irregular shapes. 1. Frost cooled cupcakes with a small amount of ganache. 2. Top with an identifying chunk of white chocolate. Wow. Every time I read your recipes I am plainly in awe. And honestly, even if they come out botched (by yours truly, that is) I don’t think this could ever be a total failure… mmmm…… truffles…. I’d like one chile-espresso and one matcha-sesame, please? Thanks, Anita. If I hadn’t left the cupcakes in the sun to get all wonky-looking, I would send some up to you. you are too cool for school. I have been reading your blog for months and it happens to be one of my favorites. It is about time I commented and voiced my appreciation. Your cupcakes are inspirational and cultivate a sense of playfulness, experimentation and adventure not to mention that your cupcakes look luscious, beautiful and delicious. Thanks so much for opening my eyes (I am still very much a cooking and baking novice, but your blog and others encourage anyone who loves food to get into the kitchen)! By the way, congratulations on the birth of your daughter earlier this summer! This is amazing. I had never heard of a chocolate tempering machine, and now I think it is the answer to all of my prayers. I tried tempering last year by using the add in piece-by-piece method and it blew, and broke anyhow and I swore it off forever. I can be a wee dramatic when it comes to my own failures. It was so much fun meeting you a couple weeks ago at our long, long dinner. I felt so bad you had to bail! But I’m glad we got to gab and eat gabagoul. Maybe some rosewater added to the pistachio-rose would help? I recently have developed an obssession with rose flavors, it’s just so delicious and distinctive in turkish delight or baklava. I had some really amazing lemonade that was also rose flavored. oh, that is such a good idea, with the toppings decoration. no guess work as to what the flavor will be, unlike those boxes of chocolates where you always pick the nasty banana cream one… although, all of your flavor combinations seem so wonderful, each would be a pleasant surprise even without the identifiers! May I ask where you got your ginja? did you bring it from Portugal or find it here? We were in Lisbon 1 year ago and didn’t bring any back, and now I wish I had. What beautiful decorations! Love the colors. 3 sticks of butter? I just can’t imagine eating that much grease in 25 cupcakes…I’d use some shortening or oil for some of that. Hey! I’d just like to say how I fell in love with baking even more when I read your blog. It’s really inspirational how you put together such beautiful and edible things that everybody enjoys – even if they don’t bake! I do hope you put up another site. I’ll will surely wait for the day when it finally happens. Thanks a million! I was looking for this cupcakes! !